We here at OneTable can barely contain ourselves, our four cups of wine runneth over. When Passover begins on Friday night, you get two celebrations in one. The Haggadah of your choice will lead you through the seder, but with the simple addition of candles and wine, you and your guests can welcome Shabbat at the beginning of the Friday night seder, or bid Shabbat adieu at the beginning of the Saturday night seder. 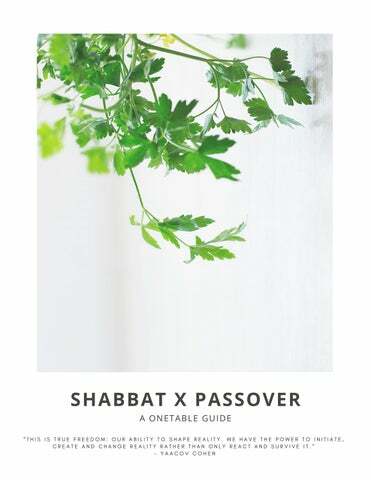 This supplement is a special addition for the weekend, a guide to help you integrate Shabbat and Passover into a single special celebration. In a word, freedom. In the narrative of the Torah, the Exodus is the peak, the denouement, the event that turns the descendants of Abraham into a nation. For millennia the Jewish people have gathered at the dinner table to tell this story. Using symbolic food and a lot of wine, we remember, as God commands us to do, just where we came from before we became the People of the Book. We reflect, we discuss, we celebrate. We invite guests to our table. We share who we are and what we have. Passover is an inheritance, yes, but it is also a gift we give â&#x20AC;&#x201D; to each other and to ourselves. ‫נֵר שֶׁ ל שַׁ בָּ ת ושֶׁ ל י ם ט ב‬ Baruch Atah Adonai Eloheinu Melech ha’olam asher kidshanu b’mitzvotav vitzivanu l’hadlik ner shel Shabbat v’shel yom tov. Blessed is the One whose mitzvot sanctify our lives, and who commands us to kindle the light of Shabbat and this holy day. B L E S S I N G .
I M P A C T .
FRIDAY NIGHT WINE B. Abbreviated Shabbat Festival Kiddush .‫הַ גָּפֶ ן‬ ‫פּ ִרי‬ ‫א‬ ְ ‫בּ ֵר‬ ‫הָ ע לָ ם‬ ֶ‫מֶ ל‬ ‫א הֵ ינוּ‬ ֱ ָ‫יְ י‬ ‫אַ תָּ ה‬ ‫בָּ רוּ‬ .‫וְ הַ זְּ מַ נִּ ים‬ ‫וְ יִ ְשׂ ָראֵ ל‬ ‫הַ שַּׁ בָּ ת‬ ‫מקַ ֵדּשׁ‬ ָ ְ ‫יְ י‬ ‫אַ תָּ ה‬ ‫בָּ רוּ‬ Blessed is the creator of the fruit of the vine. Blessed is the One who sanctifies Shabbat, the people Israel, and the festive seasons. Conclude with Shechecheyanu: .‫הַ זֶּה‬ ‫לַ זְּ מַ ן‬ ‫וְ ִהגִּ יעָ נוּ‬ ‫וְ ִקיְּ מָ נוּ‬ ‫חיָנוּ‬ ֱ ֶ‫שֶׁ ה‬ ‫הָ ע לָ ם‬ ֶ‫מֶ ל‬ ‫א הֵ ינוּ‬ ֱ ָ‫יְ י‬ ‫אַ תָּ ה‬ ‫בָּ רוּ‬ Baruch Atah Adonai Eloheinu Melech ha’olam shehecheyanu v’kiyamanu v’higianu lazman ha’zeh. Blessed are You, Infinite One, who sustains us, lifts us up, and enables us to reach this season. From here, the seder continues at your own pace. The unleavened matzah, which is uncovered and blessed during motzi, replaces challah at your table. W A N T T O G I V E T H A N K S F O R T H E M O M E N T .
Y O U C A N C O U N T T H R E E S T A R S I N T H E S K Y .
SATURDAY NIGHT WINE B. Abbreviated Havdalah Festival Kiddush .‫הַ גָּפֶ ן‬ ‫פּ ִרי‬ ‫א‬ ְ ‫בּ ֵר‬ ‫הָ ע לָ ם‬ ֶ‫מֶ ל‬ ‫א הֵ ינוּ‬ ֱ ָ‫יְ י‬ ‫אַ תָּ ה‬ ‫בָּ רוּ‬ .‫וְ הַ זְּ מַ נִּ ים‬ ‫וְ יִ ְשׂ ָראֵ ל‬ ‫הַ שַּׁ בָּ ת‬ ‫מקַ ֵדּשׁ‬ ָ ְ ‫יְ י‬ ‫אַ תָּ ה‬ ‫בָּ רוּ‬ .‫הָ אֵ שׁ‬ ‫מא ֵרי‬ ‫א‬ ְ ‫בּ ֵר‬ ‫הָ ע לָ ם‬ ֶ‫מֶ ל‬ ‫א הֵ ינוּ‬ ֱ ָ‫יְ י‬ ‫אַ תָּ ה‬ ‫בָּ רוּ‬ .‫ק ֶדשׁ‬ ֹ ‫ל‬ ‫שׁ‬ ְ ‫ק ֶד‬ ֹ ‫בֵּ ין‬ ‫הַ מַ ְב ִדּיל‬ ָ‫יְ י‬ ‫אַ תָּ ה‬ ‫בָּ רוּ‬ Baruch Atah Adonai Eloheinu Melech ha’olam borei p’ri ha’gafen. Baruch Atah Adonai mikadesh ha’Shabbat v’Yisrael v’ha’zmanim. Baruch Atah Adonai Eloheinu Melech ha’olam borei m’orei ha’eish. Baruch Atah Adonai hamavdil bein kodesh l’kodesh. Blessed is the creator of the fruit of the vine. Blessed is the One who sanctifies Shabbat, the people Israel, and the festive seasons. Blessed is the One who creates the light of fire. Blessed is the One who makes a distinction between the holiness of Shabbat and the holiness of Passover. Conclude with Shechecheyanu: .‫הַ זֶּה‬ ‫לַ זְּ מַ ן‬ ‫וְ ִהגִּ יעָ נוּ‬ ‫וְ ִקיְּ מָ נוּ‬ ‫חיָנוּ‬ ֱ ֶ‫שֶׁ ה‬ ‫הָ ע לָ ם‬ ֶ‫מֶ ל‬ ‫א הֵ ינוּ‬ ֱ ָ‫יְ י‬ ‫אַ תָּ ה‬ ‫בָּ רוּ‬ Baruch Atah Adonai Eloheinu Melech ha’olam shehecheyanu v’kiyamanu v’higianu lazman ha’zeh. Blessed is the One who sustains us, lifts us up, and enables us to reach this season. From here, the seder continues at your own pace. The unleavened matzah, which is uncovered and blessed during motzi, replaces challah at your table. On Passover there are four questions, usually asked by the youngest child. Here are four questions for your Shabbat table - make the millennial who doesn’t remember Rugrats ask them. 1. We eat matzah to remember that the Jews had no time to bake their bread before rushing to leave Egypt. What do you carry with you? What are you too rushed to do? 2. We eat bitter herbs to remind us of the bitter life the Jewish people experienced as slaves in Egypt. What’s a challenge you faced this year? What’s the greatest thing you learned from it? 3. We dip the parsley into salt water. The vegetables remind us of spring and new life. The salt water reminds us of the tears of the Jewish slaves. When we dip we remember the pain of the past and the hope of a new future simultaneously. How do you remember the past? What are you doing to change the future? 4. On all nights we eat sitting upright or reclining, and on this night we all recline. What makes you feel comfortable? When are you free to relax and recline? Passover is all about asking questions; here are two in honor of Shabbat: 1) I get that Passover is a holiday. Does Shabbat count as a holiday too? Like, every week? Yes. Shabbat is a holiday every week and we’re not kidding. In fact, our modern English word 'holiday' comes from an Old English blend of holy and day, and in Jewish tradition Shabbat is the holiest day of the year every week. More holy than… Yom Kippur? While it’s true that Rosh Hashanah and Yom Kippur are holy AF and the three pilgrimage festivals of Passover, Shavuot, and Sukkot are also strong contenders, if you want to go for the gold, it’s Shabbat all the way. Its frequency doesn’t diminish its importance, which is pretty radical when you think about it. Shabbat is a weekly act of recreation, and creation is our foundation as a people and as a faith. 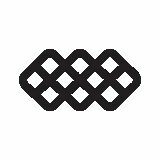 Shabbat asks us to recall the narrative of a world created in an evolution of seven days, the seventh of which is set aside as a sacred “other,” a day of rest, reflection, and recalibration. In our modern l ives, Shabbat inspires us to be the ongoing co-creators of a better world by embracing a cycle of work and rest in our own lives. As such, no other holiday in the Jewish calendar, including Yom Kippur and Passover, supersedes Shabbat. 2) Wait, so if Passover is seven days long, and Shabbat is every seven days, does this mean Passover ends on Shabbat too? Yes. Well, sort of, depending on when Passover ends for you. Some follow the Reform practice of ending the holiday with one festival day of yom tov, others follow the tradition of ending with two festival days. So, depending on your practice, the last full day of breadlessness for Passover 2019 might be Friday, April 26th or Saturday, April 27th. Whether you’re celebrating the end of Passover or the almost-end, Shabbat dinner is a perfect opportunity to gather the friends you missed during first or second seder and eat one last matzah pizza… or order the real deal. PASSOVER RECIPES ON PASSOVER WHETHER YOU REACH FOR DATES OR APPLES, CHRAIME OR GEFILTE FISH, RICE OR MATZAH BALLS, WE WANT TO HELP YOU FEEL CONFIDENT IN THE KITCHEN AND GIVE YOU A TASTE FOR THE MANY WAYS JEWS AROUND THE WORLD CELEBRATE THROUGH FOOD. WE'VE COLLECTED SOME RECIPES FROM OUR COMMUNITY AND PARTNERS TO COOK UP FOR YOUR PASSOVER X SHABBAT SEDER! What you'll need: One 14-ounce bag sweetened shredded coconut One 14-ounce can sweetened condensed milk 2 tablespoons coconut flour or matzo meal 3/4 teaspoon kosher salt, divided 1/4 teaspoon ground cinnamon 1/4 teaspoon ground cardamom 2 eggs, separated 1/2 cup halva crumbles Directions: 1. Preheat the oven to 325Â° and line 2 sheet pans with parchment paper. 2. In a large bowl, mix the coconut, condensed milk, coconut flour, 1/2 teaspoon of the salt, the cinnamon, cardamom and the egg yolks until smooth. 3. In a separate medium bowl, using an electric hand mixer, beat the egg whites with the remaining 1/4 teaspoon of salt to stiff peaks. Fold into the coconut mixture, followed by the halva. 4. Scoop 2 tablespoons mounds of the mixture on the sheet pans, 2-inches apart. Bake for 15 minutes, then remove from the oven. 5. With a small bowl of water, dip a 3-inch ring cutter in the water, then one at a time, roll around the edges to bring in the melted halva into a tighter mound. 6. Return to the oven and continue to bake until golden brown, another 15 to 20 minutes more. Remove from the oven and repeat rolling with the ring cutter to make a perfectly round macaroons. Let cool completely, then serve.